On 27 March 2014, the then Minister for Social Services, the Hon Kevin Andrews MP, asked the House of Representatives Standing Committee on Social Policy and Legal Affairs to inquire into and report on the Australian Child Support Program. Some 16 months later (20 July 2015), following an extensive public consultation process, the Committee tabled its report and concluded that the Child Support Program was “generally functioning as intended”. In this article, the authors: (a) examine the background and political undercurrents to the Inquiry; (b) consider the scope of the Inquiry’s Terms of Reference; (c) review the sources of the written and oral submissions; and (d) examine the Committee’s recommendations. It is argued that while many of the recommendations look sensible and have merit, there is likely to be little capacity or political will to act on the recommendations in the current economic and political environment. This article discusses how the concept of marriage as a partnership could be combined with the Stanford emphasis on legal and equitable interests to provide a new way to approach the treatment of notional assets in proceedings for property adjustment. A Notice of Risk is now required to be filed with all applications for parenting orders in the Federal Circuit Court. This article discusses the importance of the Notice of Risk in raising issues of family violence or child abuse, and the requirement for it to be filed in all matters. It also provides guidance as to how to complete the notice effectively. This article first examines the possible distinction drawn between parents and non-parents when it comes to assessing a child’s best interests under s 60CC of the Family Law Act 1975 (Cth). The decision of the Full Court in Burton v Churchin suggests that parents and non-parents must be treated differently in decisions about parenting. Second, the article discusses who may be considered to be a parent under the Family Law Act and under the Child Support (Assessment) Act 1989 (Cth), and the problematic disjuncture between legal, social and biological parenthood. In Babett v Falconer  FamCAFC 124 the Full Court recognised that a “less restrictive approach” is called for in child support litigation. What are the boundaries of this “less restrictive approach” and how does that approach operate in practice? 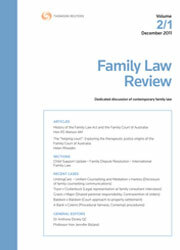 This article considers the application of the facilitative mediation model in family law disputes and explores the advantages and disadvantages of its application. For the PDF version of the table of contents, click here: Fam L Rev Vol 5 No 3 Contents.